Two papers about genome-scale reconstruction and analysis were published by Sebastián Mendoza in March 20th and May 23th. These articles are entitled “Mapping the Physiological Response of Oenococcus oeni to Ethanol Stress Using an Extended Genome-Scale Metabolic Model” and “Traceability, reproducibility and wiki-exploration for “à-la-carte” reconstructions of genome-scale metabolic models“, respectively. Both papers were submitted while Sebastián was working as a project engineer at the laboratory of Alejandro Maass (Mathomics, Center for Mathematical Modeling, Faculty of Mathematical and Physical Sciences, University of Chile) and now they have finally seen the light. Contreras et al., 2018 is the follow-up study of a previously published article (Mendoza et al., 2017) and was conducted in collaboration with the laboratory of Eduardo Agosín at the Department of Chemical and Bioprocess Engineering of the Pontifical Catholic University of Chile. The first paper, which was published in the journal Frontiers of Microbiology, studies how different ethanol concentrations in the media affect the metabolism of Oenococcus oeni, the malolactic bacteria that performs the secondary fermentation during winemaking. 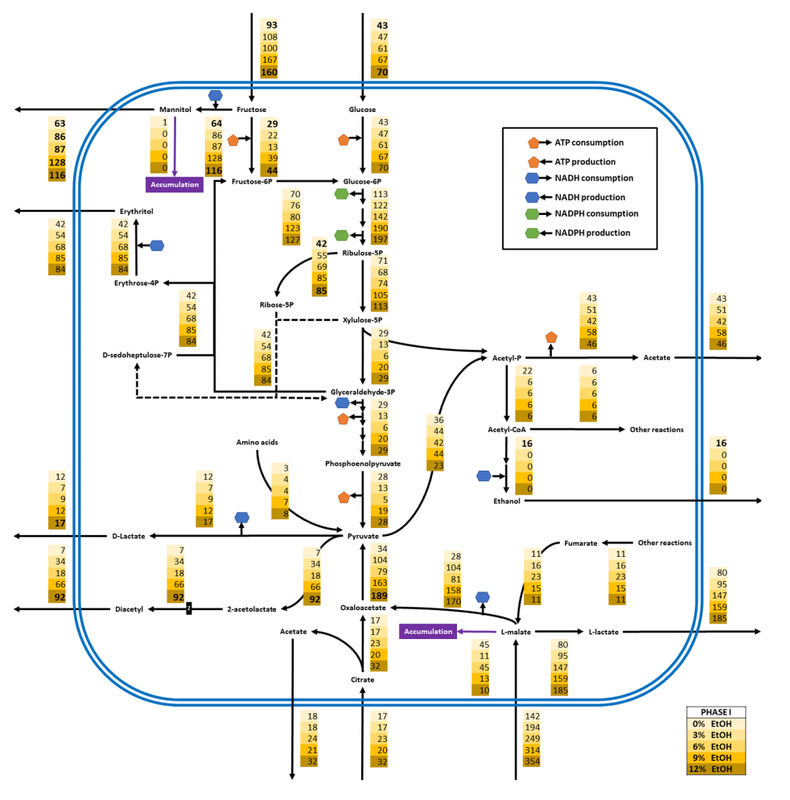 Besides providing the first wine-like chemically defined media for this microorganism, this paper takes advantage of the previously reconstructed genome-scale metabolic model and shows the distribution of fluxes under different ethanol conditions. The second paper was published in Plos Computational Biology and it provides a tool for genome-scale metabolic reconstruction (AuReMe). AuReMe benefits from the use of Docker, a platform that allows pre-installation of different software tools. Thus, users don’t have to pre-install any package by themselves or to worry about the correct version of the pre-installed software. They just have to download AuReMe which is open-source and ready to use in any operative system. If you have seen a published genome-scale model and have thought “the reconstruction process is impossible to reproduce”, then AuReMe is the right choice for you since traceability in the reconstruction process is the most important feature in this tool. Together, these papers contribute to the systems biology field by providing a tool for reconstructing genome-scale models and by providing a better understanding of an important lactic acid bacteria in winemaking.